The Ideal Summer Romper for Under $15! One type of outfit inspiration that I really enjoy sharing on my blog are budget friendly yet trendy and fun looking for nights out. As I've said in past posts, nightlife attire is a very certain look, but you don't have to spend a lot to look great! Nor should you- anything can happen during nights out (from drinks being spilled to God forbid more serious situations! ), so the way to go is by finding the best bargain pieces that still fit your style. My personal style for going-out also tends to be a little bit more conservative... if I do decide to highlight a feature such as my legs or chest, I tend to be covered up in other areas! I personally think that showing less skin, or being tasteful about what you do show, is always the classiest way to go. :-) For example, since this romper is a little bit shorter, I chose to pair it with jeweled flat sandals instead of heels or wedges! Summer nightlife attire is a bit more flexible and you can often put together a whole outfit around a cute dress or romper! 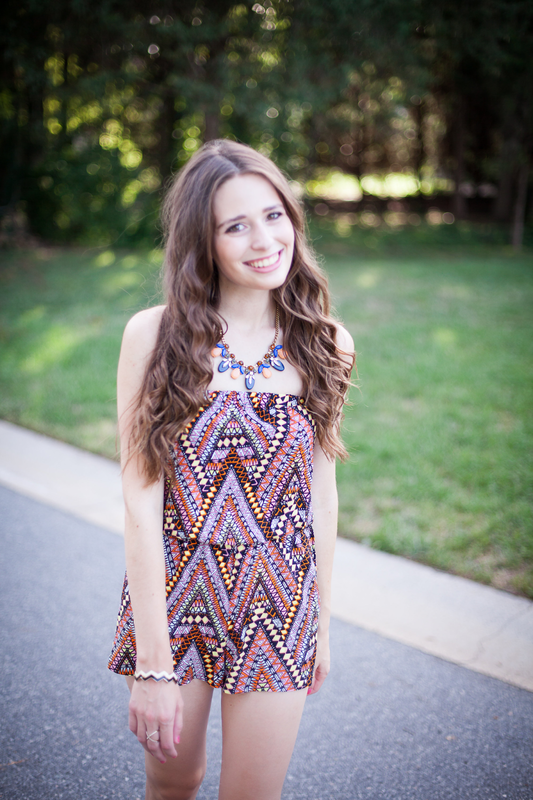 I am just obsessed with the romper that I'm wearing in today's post. It is bright and fun, comfortable and lightweight to wear (so perfect for those hot summer nights), and it is under $15!! What what! Unfortunately the print that I'm wearing here was an in-store exclusive only, but it is available online in some other fun options. How gorgeous is this print? I haven't been going-out too much in post grad life, but I do have a dear friend (from blogging! Can you guess who?) coming to visit me in August, so I'm looking forward to showing her some of my favorite Charlotte nightlife spots then. I hope that everyone is having a great start to your weekend! Thanks as always for reading! That is a really cute romper, I think you are so right about covering up a little big just adds class to the look! This romper is so cute on you, Annaliese! I'm not the biggest fan of rompers but this one is darling! Such a cute romper! I love all the colors! I definitely agree that spending a lot of money on a going out outfit is a waste...I feel SO frustrated when someone spills a drink or food on something nice, which always seems to happen at bars or clubs. You look completely chic and cute. Legs for days girl! I love this cute little romper! The colors and pattern are so pretty! Love the print of that romper! Such a great price and it looks perfect with that statement necklace too! OMG If i've said it once I'll say it again, I LOVE THE ROMPER!I could myself wearing this at a summer festival or something. Sooooo cute! 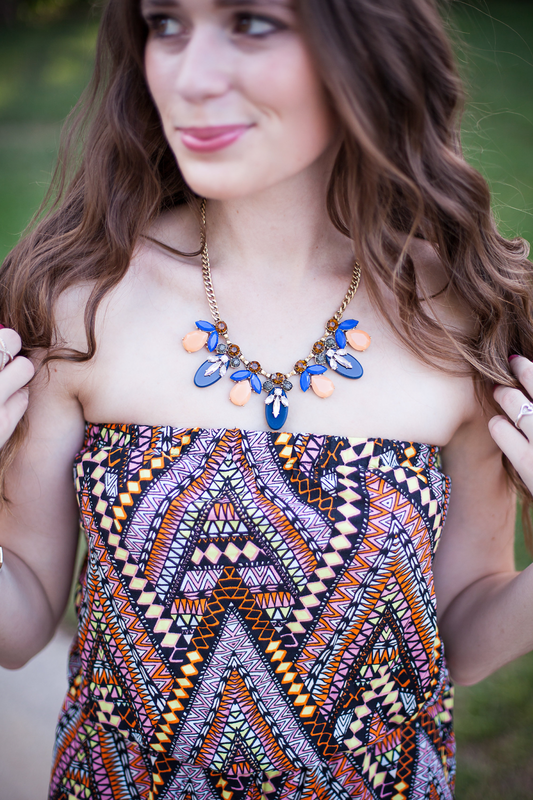 This statement necklace looks like it was made for the romper! This romper is adorable and so colorful!! Also a major plus that it's at such a great price! I love your romper and your hair looks so great. 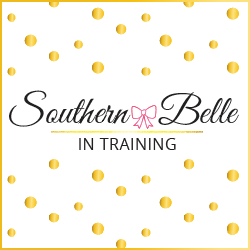 Have you ever done a tutorial? Love that romper and the fact that it's under $15! I also agree with you -- it's perfect for summer nights! Midweek Ramblings + Recent Purchases. My First Apartment: Bedroom Reveal!! Summer Fun at Craft City Social! 2016 #NSale: My Favorites + What I Purchased. Summer Workout Wear with Fabletics. The Cutest Business Casual Look. How to Make a Car Emergency Kit. TRAVEL GUIDE: Virginia's Shenandoah Valley. Decorating a Dining Room on a Budget.